Who would name their first car Coal Scuttle? I would love to know what they were thinking. Apart from the interesting name the Coal Scuttle was the first production car from Aston Martin. 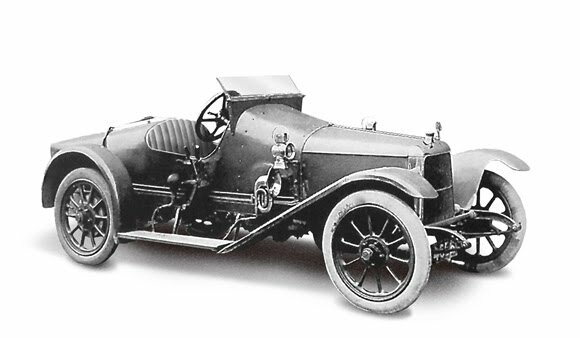 It was ready to roll in 1915. The odd thing though is the second Coal Scuttle didn't appear until five years later. Perhaps they were busy winning the races that gave them their first name Aston. That is the hill climb events at Aston Hill. The second name Martin comes from Lionel Martin the racing driver who together with Robert Bamford started Aston Martin. There isn't a lot of info I could find about this beautiful car. The ones that were built in the 1920's were incredibly successful and there is one 1922 Aston Martin still racing today. The history of Aston Martin makes for an interesting read and you can see why they are such awesome cars when they started out like this.